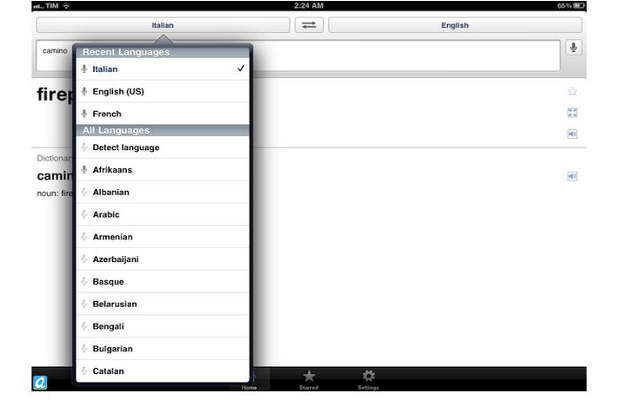 The most famous Google Translate App is now available for Apple iPad. Good news for iPad owner that the app is now universal for iOS devices which supports iPad and iPad 2. This iPad app looks same as the Google Translate app for iPhone but it have optimised for bigger screen. App for iPad will display three tabs at bottom so anyone can switch between translation, setting and favorites tab quickly. It also support translation by speaking text instead of typing it. This option works for 17 languages. App is available for download in the iTunes app store. User can also access his or her translation history even when offline. User also have the option to see the translation in full screen. Google Translate supports about 60 languages of the world.